Global interest rates are now at historical lows. Conversely we are seeing record prices for asset prices be they share prices of listed companies, privately held Internet startups, art, collectible cars or real estate. The theoretical value of an asset is the net present value of the discounted future cash flows it can generate. The lower the acceptable internal rate of return (IRR) an investor accepts, the less future cash flows are discounted and the greater an asset can be valued. The impact of the decrease in interest rate by central banks on asset prices has a time lag. When investors value assets they are thinking of investing in or when companies value acquisition target, their cost of capital is a crucial variable. While corporate cost of capital is correlated with the federal rate there is a delay. Investors seeking higher yield than government bonds after rates decrease start investing in riskier asset classes like corporate bonds and equities. Given that future rate expectations matter as much as the current rate, it takes years of low rates with expectations for them to continue for investors to yield chase and truly lower private investors’ cost of capital. This is precisely what has happened. As global central banks have held interest rates near 0 for years, investors have invested in riskier asset classes pushing their yield down to record lows. Very low rates have a huge impact on asset prices. Let’s say that on a particular project investors used to expect a 10% return. For the sake of argument, let’s assume that that asset generates $100,000 in annual income. To make things simple let’s assume no changes in that income going forward. The fair market value of that property would be $1 million. A 200 basis point decrease in acceptable returns to 8% would value the property at $1.25 million. However if a very low rate of return of 2% is acceptable, then the asset is worth a whopping $5 million! The problem is that for acquisitions and investments made in periods where the cost of capital is low to pan out, interest rates have to remain low. Should they normalize to a still low level of say 4%, that same asset would be worth $2.5 million, shedding half its value! The low cost of capital in today’s world is fueling an investment and M&A boom. On top of that, investments are being made by people trying to get their assets out of politically risky countries like China, Venezuela, Argentina, Russia and the Middle East. As they are looking for safety rather than economic return this pushes yields even lower. When rates start to normalize in a few years, people will come to regret the prices they paid for assets when money seemed virtually free. 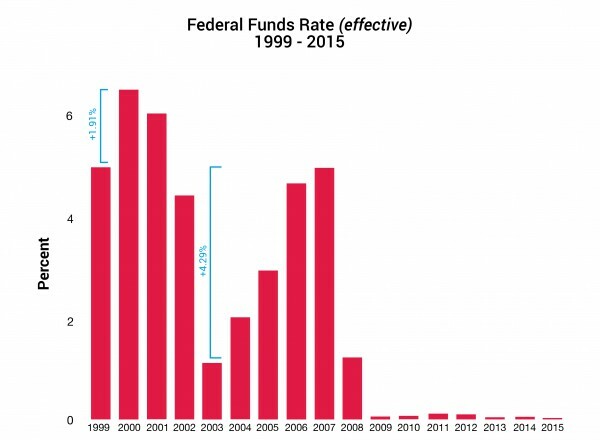 It’s not a coincidence that the Internet bubble burst after the Fed increased the effective Feds Fund Rate by 1.91% between 1999 and 2000. Likewise the real estate bubble burst after the Fed increased the effective Feds Fund Rate by 4.29% between 2003 and 2007. A similar rise in 2016 and/or 2017 could very well turn the current boom to a bust. There are clear actions we can take to ready ourselves for the shift. As entrepreneurs, we don’t control the vagaries of the macro environment. We just happen to operate in the times that we live in. It’s important to be aware of macro conditions to take advantage of them. Given the amount of capital available and the competitiveness of rounds, I would recommend entrepreneurs sell a small stake in their company in a secondary transaction. These used to be only possible at late stages, but the appetite for startups has made it possible as early as the Series A if the round is competitive. This allows entrepreneurs not to have to worry about the downside, while still having enough skin in the game to pursue big opportunities. Given that the funding environment will change, I would take advantage of the current conditions to raise more capital than you think you need. I would simultaneously be more cautious about spending it than your investors probably want you to be to make sure you have a cushion for when things change. With regards to valuation, you can go two ways. If you are pursuing a huge category where you can build a $100 billion company, by all means push the valuation as high as possible, raise as much as possible and try to win at all costs. However, if the size of the prize is less clear I would urge caution about pushing the valuation so high that you price yourself out of potential exits. For investors, this is an amazing time to sell. Valuations are high and exit opportunities are more readily available than ever before, contrarily to what Mark Cuban recently said. Jose and I now systematically try to sell 30% of our stake in each up round as a matter of principle when possible. Given that we are not lead investors there is no negative signaling. We don’t have external capital to deploy and need to have exits to continue investing in startups making our request all the more reasonable. I would also exercise caution when it comes to investing in startups at high valuations. That does not mean that we stopped investing. Quite the contrary, we invested in over 30 startups since the beginning of the year – a historical record for us. However, we have shifted our focus from seed investments to seed extensions and Series A where valuations are more reasonable. We also invest in the more proven late stage deals. We take comfort in the fact that we are investing in vertical transactional consumer facing marketplaces with real revenues and unit economics. Uber for instance may seem superficially expensive, but it has real revenues and is an amazing business. Moreover, we’ve made much more from our exits in 2015, than the amounts we invested so we are clearly in harvesting mode. If you have assets, today is a good time to sell. You may miss further increases and a possible bubble in the coming 12-18 months, but you will also miss the inevitable bust!